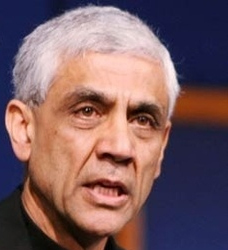 Vinod Khosla, a native Indian and the world's No.2 ranked Venture Capitalist, is considered as one of the most influential personalities in Silicon valley. He is a partner in the venture capital firm Kleiner Perkins Caufield & Byers. Aged 50, he was among the first venture capitalist to understand that internet technology and fiber optics could make communications so fast, cheap and easy and spot the potential of companies that sell gear for high-speed optical networks. He was born in 1955 in a military family in New Delhi, India. He earned a B.Tech degree from the Indian Institute of Technology (IIT), Delhi. After that he attempted to start his own company in India, a dream since the age of 15. Being frustrated by the experience, he gave up his mission. Then he went to United States and completed M.S degree in Biomedical Sciences at Carnegie Mellon and also earned an M B A degree from Stanford University in 1979. At 27, Khosla became successful when he co-founded Sun Microsystems with a German student Andreas Bechtolsheim, a multi millionaire. Khosla ran Sun until 1984. In 1986, he joined in Kleiner Perkins, a firm that funded Sun as a general Partner. During this time, Khosla has played key roles in starting companies that are involved in multimedia, semiconductors, video games, Internet software and computer networking. He conceived the idea to optimize SONET for data, a scheme that led to the creation of Cerent Corp, a telecommunications-equipment company which Cisco acquired in 1999 for $6.9 billion. Khosla was also instrumental in launching Juniper Networks, a company many thought as the next Cisco. Others include Viant, Extreme Networks, Lightera etc. Khosla has won admiration because of his ability to build and fashion companies and technologies. He plays an active role and is not satisfied to sit back and let others work the plans while he okays the progress. Though he was successful in almost all his ventures, there has been one time that Khosla had been wrong. He backed 3DO Co, a game-maker whose shares now sell for a fraction of the initial offering price in 1993. Khosla's current effort is funding and managing application service provider start-ups. He is chairman of two such firms, Corio and Asera. This much respected entrepreneur lives in Woodside, CA with his wife and four daughters. Khosla believes in closeness in family. His rules for life include having breakfast and dinner with his family. He is one of three billionaires of Indian origin in Forbes magazine's list of America's richest 400 people.